The 2015 Everest season is getting underway with teams arriving in Kathmandu. I have friends making attempts on both sides of the mountain and other 8000m peaks in the area. As I see their posts and have discussions with them prior to their departure I’m taken back to 4 years ago when I was preparing for the adventure of a lifetime. There’s a ton that goes into a 2 month expedition logistically, but the most important is making sure your work and family are in order prior to stepping on that plane. With any adventure, large or small, the anticipation of leaving is worse than actually leaving. I remember creating spreadsheets with financial and bill information, listing contacts for everything I could think of, hiding gifts with clues throughout the house for the kids and appreciating every second I had with the family. I also did one of the hardest things I ever did, made a video…just in case. In a matter of days, I would set off on my two-month expedition to Mount Everest. It wasn’t the climbing that had me anxious—it was the thought of being away from my fam- ily for so long. When it came to the climb itself, I wasn’t worried. I was in the best shape of my life, and I had planned everything down to the last detail. But I was also aware of the reality that people do die on Everest. No matter how well prepared you are, there are always things that are out of your control—extreme weather, shifting icefalls, avalanches, cerebral edema. 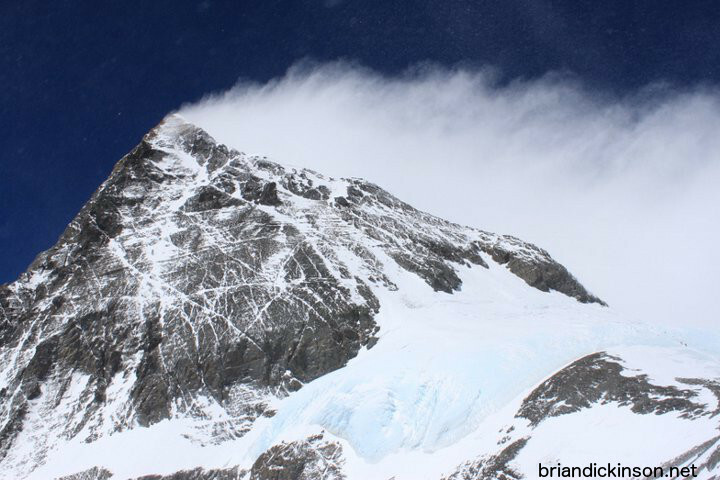 Let’s face it, there’s a reason they call the top of Mount Everest the death zone. As the winds picked up and rain began pelting my office window, I cast one last glance at the darkened face of Mount Si, which was slowly disappearing into the Washington mist. Then I sat down at my desk and powered up my MacBook. After I’d centered myself in the video frame, I took a deep breath and hit Record. I could already feel the tears burning behind my eyes. Fortunately nobody but me as seen the video to date. I know that each climber goes thru similar struggles of living life as an adventure balanced with the responsibility of having a job, family, friends, etc. For those far removed from this type of adventure it’s impossible to understand the risk taking, but for those wired to reach great heights…they get it. Each person, summit or not, will return a little bit different. Statistically some won’t return and their family and friends may resent their decisions in letting them go. I pray that 100% return, but for those that don’t come back I hope their family / friends honor and respect their decisions and know, in their minds, they were truly living life beyond what others can imagine.